David Petraeus was sworn in as CIA director in September 2011. Editor's note: Retired Gen. David Petraeus stepped down Friday as head of the Central Intelligence Agency - 14 months after taking the job, days after the presidential election and days before he was to testify before Congress about an attack on a U.S. consulate in Libya that left four Americans dead. [Updated at 7:59 p.m.] Speaking on CNN's "Erin Burnett OutFront," Rep. Peter King (R-New York) called Petraeus' resignation "a real loss for the country, a real loss for the CIA." "We're going to lose the best man for the job, but again America is adaptable," said the chairman of the House Homeland Security Committee. "Put it this way, anytime you lose a David Petraeus, the country is not as safe as it could be." [Updated at 7:11 p.m.] The FBI investigated a tip that the woman Petraeus was involved in an extramarital affair with was Paula Broadwell, who co-wrote a biography about him, a U.S. official said. Broadwell spent a year with Petraeus in Afghanistan, interviewing him for the book "All In: The Education of General David Petraeus." CNN has not been been able to reach Broadwell for comment. It is not clear if Broadwell is the woman with whom Petraeus had admitting having an affair, leading to his resignation Friday as the head of the CIA. [Updated at 5:43 p.m.] After getting a tip that Petraeus was involved in an extramarital affair, the FBI launched an investigation to see if this relationship posed a "potential security risk," a U.S. official said. The official added there is no suggestion the FBI was probing Petraeus for any criminal wrongdoing, only because they feared he might be "in a vulnerable spot." [Updated at 5:40 p.m.] The woman who David Petraeus had an affair with was not a member of the armed forces or the CIA, sources close to Petraeus told HLN's Kyra Phillips. The retired general is extremely disappointed in himself and devastated that he's hurt his family, the sources say. [Updated at 4:52 p.m.] Acting CIA Director Michael Morrell will testify next week before the Senate Intelligence Committee about the fatal attack in Benghazi instead of David Petraeus, according to the office of that committee's chairwoman, Sen. Dianne Feinstein. [Updated at 4:25 p.m.] U.S. Sen. John McCain extolled Petraeus as one of "America's greatest military heroes," expressing his gratitude for his "decades of work on behalf of our nation, our military and our security." McCain, an Arizona Republican and the ranking member of the Senate Armed Services Committee, added, "His inspirational leadership and his genius were directly responsible - after years of failure - for the success of the surge in Iraq." [Updated at 3:59 p.m.] Sen. Dianne Feinstein, the head of the Senate Intelligence Committee, said, "I wish President Obama had not accepted this resignation, but I understand and respect the decision." 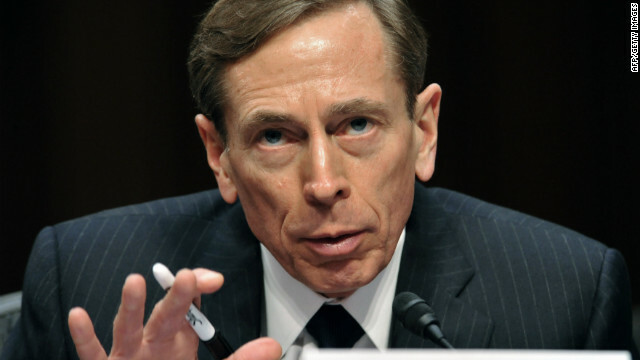 The California Democrat praised Petraeus for giving the CIA "leadership, stature, prestige and credibility both at home and abroad," calling him reliably in "command of intelligence issues" and "especially cooperative with Congress." [Updated at 3:53 p.m.] The chairman of the House Homeland Security Committee praised outgoing CIA Director David Petraeus, saying, "I regret his resignation and wish him and his family the very best." "Gen. Petraeus is one of America's most outstanding and distinguished military leaders and a true American patriot," said Rep. Peter King, a Republican from New York. [Updated at 3:41 p.m.] David Petraeus met with President Barack Obama on Thursday, at which time the then CIA director offered his resignation, a senior administration official said. The president then formally accepted Petraeus' resignation in a phone call Friday afternoon, according to the same official. [Updated at 3:38 p.m.] President Obama said, in a statement, that today he accepted Petraeus' resignation as CIA director. The president added he is "completely confident that the CIA will continue to thrive and carry out its essential mission," now under the leadership of Acting Director Michael Morrell. Obama lauded Petraeus for his "extraordinary service to the United States for decades," calling him "one of the outstanding general officers of his generation" and praising his work as CIA director. The president concluded by saying, "Going forward, my thoughts and prayers are with Dave and Holly Petraeus, who has done so much to help military families through her own work. I wish them the very best in this difficult time." Holly Petraeus led the Consumer Financial Protection Bureau’s Office for Servicemembers Affairs. [Updated at 3:17 p.m.] Shortly before Petraeus' resignation was announced, White House press secretary Jay Carney told reporters that "the president thinks Gen. Petraeus has done an excellent job." When asked about the general's job status, Carney reiterated that President Obama approves of the job done by the CIA director while adding, "I don't have personnel announcements to make from here today." [Updated at 3:13 p.m.] Petraeus issued a statement announcing his resignation, saying, "After being married for over 37 years, I showed extremely poor judgment by engaging in an extramarital affair. "Such behavior is unacceptable, both as a husband and as the leader of an organization such as ours. This afternoon, the president graciously accepted my resignation." [Initial post, 3:08 p.m.] CIA Director David Petraeus submitted his resignation Friday to President Barack Obama, citing personal reasons, a U.S. government source said. According to the source, Petraeus admitted to having an extramarital affair when he asked to resign. A retired U.S. Army general who served as the top U.S. commander in Iraq and Afghanistan, Petraeus was sworn in as the head of the CIA in September 2011. Director of National Intelligence James Clapper issued a statement Friday confirming that Petraeus had turned in his resignation, saying his "decision to step down represents the loss of one of our nation's most respected public servants." Had his affair been with a man I'm sure he never would have been forced to resign. What BS!!! When should a mans personal life affect his job... perhaps never. Who the hell cares!!! We've had presidents who have done the same thing & not a one ever resigned.His leadership abilities are not in question here,his moral values are.Don't get me wrong,I do not condone his behavior on this issue,that's between him & his maker.Give it a break!!! Was she a Russian spy or something ? I am now leaving this group and there will be no intelligent life left here until I return. The Chief gate keeper of American security decided to maximise his public profile by informing the World in a biography while keeping the Gate of secrecy for the American nation. No? This must be some black humour. why is it that days before the head of the CIA is to go in front of Senate Intelligence Committee he resigns?? Claming he had a Afair!! We had a president who had a afair who turned the oval office into the oral office.. The head of CIA should be forced to go to court and let them know what he knew. It is kind of funny the people "resigning" in the near fucture who which could of had known about the plans to over run the libia Consult. It is hard to belieave the people in charge of protection for America can resign and keep there retirement and not do there job and report to what they knew about Libia While we have lost soles, or blood on the hands of thoese in charge of protecting them. Yes David Petraeus should be striped of all medls and retirement funds/ penseion money if found he did not do his job to the up most responsability. It is said he could of saved the lives of thoese lost in Libia. Sir Walter Scott – "Oh what a tangled web we weave – When first we practice to deceive". This whole thing reeks of cover-up and I wonder if we'll ever know who did the most covering up. My opinion is that there were multiple people from multiple offices/depts covering up and I just find it almost impossible to believe that the President knew NOTHING about this. How on earth can something as big as this – not be reported to the president? It just doesn't make sense. Armstrong and Petraeus. Two former gods. Head of the CIA managed to keep a secret, better fire him.